Chicken noodle soup is the quintessential American comfort food and somehow always manages to make us feel better, whether we’re under the weather or just had a rough day. While we love the traditional soup, we’re more a fan of hearty casseroles, so turning this dish into a smooth and cheesy baked meal was a no-brainer! We cannot say enough great things about this. It absolutely hits the spot and is the best thing to come home to after a long day. Plus, you can make it ahead of time and then just put it in the oven when you’re ready to eat! Family members across the board will rave about this and you’ll be surprised how quickly people will start requesting it it’s really that good! In a large bowl, combine soups and heavy cream and stir together to mix. 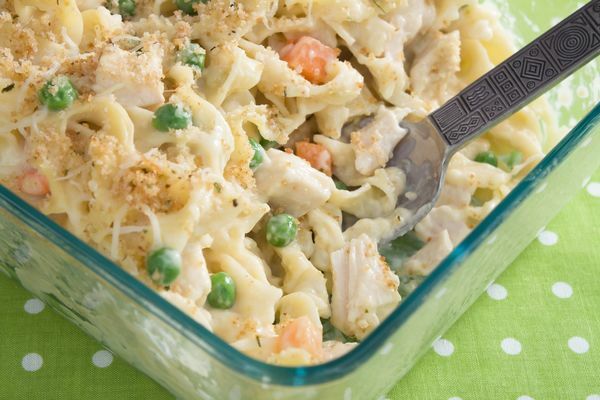 Add frozen vegetables, cheddar cheese, cubed chicken and egg noodles, and season with garlic salt and pepper. Pour mixture into a large casserole dish and lightly tap it against the counter to remove air bubbles and smooth it out. In a separate bowl, toss together breadcrumbs, parmesan cheese and melted butter. Sprinkle evenly over the top of casserole. Place baking dish in oven and bake for 30-35 minutes, or until vegetables are tender and sauce is bubbly. Remove from oven and let cool 5 minutes. Transfer to serving bowls and garnish with more cheese.